Marsilio Ficino (also known by his Latin name, Marsilius Ficinus) (October 19, 1433 – October 1, 1499) was one of the most influential humanist philosophers of the early Italian Renaissance, an astrologer, a reviver of Neoplatonism who was in touch with every major academic thinker and writer of his day, and the first translator of Plato's complete extant works into Latin. 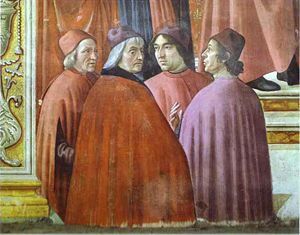 Ficino worked with Giovanni Pico della Mirandola under the patronage of Lorenzo de’Medici at the Academy of Florence, an intended revival of Plato's school. He attempted a synthesis of Platonism with Christian theology, and greatly influenced the direction and tenor of the Italian Renaissance and the development of European philosophy. Ficino introduced the concept of the immortality of the soul into Catholic doctrine. His commentary on Plato’s “Symposium” is said to be the origin of the common term “Platonic love.” He also developed the concept of the "dignity of man," embodying the new Renaissance attitude that man had value. Ficino was born in 1433 at Figline in the Val d’Arno. His father, Diotifeci, was a physician under the patronage of Cosimo de’ Medici. 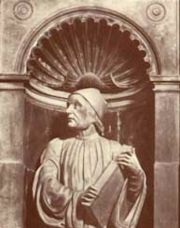 Ficino became acquainted with Cosimo de’Medici, then the leader and supporter of scholarship at the Academy of Florence. Cosimo de’ Medici took the young man into his household and became his lifelong patron, making him tutor to his grandson, Lorenzo de' Medici. Giovanni Pico della Mirandola, the Italian humanist philosopher and scholar, was another of his students. Ficino studied under Niccolo Tignosi, a scholar of Aristotle, at Florence University, where he mastered Latin and literature, and continued to study medicine. During the sessions at Florence of the Council of Ferrara-Florence (1438-1445), a failed attempt to heal the schism between the Latin and Greek churches, Cosimo de' Medici and his intellectual circle made the acquaintance of the Neoplatonic philosopher Georgius Gemistos Plethon (1355-1452), whose discourses on Plato and the Alexandrian mystics so fascinated the learned society of Florence that they named him the second Plato. In 1459 Ficino became the pupil of John Argyropoulos, who was lecturing on Greek language and literature at Florence. In 1462, Cosimo decided to re-found Plato's Academy, situated at the Medici villa at Careggi, outside Florence, and chose Ficino to lead it. In the academy, Ficino’s major role was translator of the works of Plato from Greek into Latin. He completed the first translation of Plato in 1470; however it was not printed until 1484. A Latin version of the works of Plotinus was accomplished in 1492. Ficino’s translations of both Plato and Plotinus remained in general use until the eighteenth century. Ficino translated a collection of Hellenistic Greek documents of the Hermetic Corpus (Yates 1964), and the writings of many of the Neoplatonists, including Porphyry, Iamblichus, and Plotinus. Following suggestions laid out by Gemistos Plethon, Ficino tried to synthesize Christianity and Platonism. In 1473 Ficino was ordained as a priest and later as canon of Florence Cathedral. His sermons in the cathedral attracted large and enthusiastic audiences. He did not hesitate to send letters to the leaders of religious orders and even to the pope. Ficino's most important philosophical accomplishment was his treatise Theologia Platonica de immortalitate animae (“Platonic Theology, On the immortality of the Soul”) (1474). In his enthusiasm for every rediscovery from antiquity, Ficino exhibited an interest in the art of astrology, which aroused the disapproval of the church. In 1489 he was accused of magic before Pope Innocent VIII and only a strong defense preserved him from the condemnation of heresy. Ficino, writing in 1492, proclaimed, "This century, like a golden age, has restored to light the liberal arts, which were almost extinct: grammar, poetry, rhetoric, painting, sculpture, architecture, music...this century appears to have perfected astrology." His memory has been honored with a bust in the cathedral Santa Maria del Fiore in Florence. A collection of letters written by Ficino between 1474 and 1494 survives and has been published. He also wrote De amore and the influential De vita libri tres (Three Books on Life). De vita, published in 1489, provides a great deal of curious contemporary medical and astrological advice for maintaining health and vigor, as well as elaborating on the Neoplatonist view of the world's ensoulment and its integration with the human soul. In the Book of Life, Ficino details the interconnections between behavior and consequence, listing a number of influences that hold sway over a man's destiny. Ficino was ordained as a priest when he was 40 years old. Desiring to attract atheists and skeptics to Christ through the philosophy of Plato, Ficino initiated the merger of Christianity and Platonism. Legend says that one day Ficino, by a miracle, recognized the almightiness of the Virgin Mary and was suddenly converted from a heathen to a soldier of Christ. He abandoned pagan literature and became especially involved in the works of Pseudo-Dionysius the Areopagite (through history, a series of famous mystical works applying Neoplatonic language to the interpretation of Christian theological and mystical ideas, has been attributed to the Areopagite), and in the Epistles of Saint Paul. Ficino asserted that Pseudo-Dionysius the Areopagite followed the philosophical lineage of St. Paul. In his commentary on the Phaedrus, Ficino argued that the love spoken of by Plato and by Paul is equivalent; God is absolute beauty and absolute good; on this topic Plato and Pseudo-Dionysius the Areopagite are reconciled. Ficino’s important work, the Theologia Platonica, in which he explained that reasonable verification of the Christian belief could be discovered in the theories of the Platonists, was completed just after his ordination. Theologia Platonica describes the universe, in accordance with neo-Platonist perspective, as a harmonious and beautiful system, composed of degrees of being which range from material things up to God. Ficino emphasized the position of man as the link between the spiritual and the material. Ficino regarded the theory of Aristotle as beginning from the same philosophical heritage as the theory of Plato, and appropriated St. Augustine’s concept of Ideas, as explained in Augustine’s theory of Illumination. Ficino did not think it was necessary to choose between the beauty of classical thought and Christian theology; both could be appreciated simultaneously. Ficino and the Platonic Academy of Florence exerted a long-lasting influence on the Renaissance and on European society. Under his influence, an eminent and brilliant group of people, including Lorenzo de’ Medici, Alberti, and Pico della Mirandola, assembled centering upon the academy. Many Renaissance artists were also inspired by Ficino and the academy became a center of pilgrimage for intellectuals. Ficino had many talents as a philosopher, scholar, doctor, priest and musician. He translated the whole works of Plato and many of the Greek classical writings into Latin. He was an inexhaustible worker, translating at amazing speed, and tried at remain true to the original meaning of the texts. Although he sometimes made mistakes in his translations, there can be no doubt of the benefit he bestowed on the men of his age by making the Greek classics available to them. He was a skilled artist and musician. In his explanation of Platonic theology, Ficino included his theory of art and the significance of imagery in painting. In his commentary on Symposium, De Amore he introduced a new concept of love, Platonic love, which added grace to Renaissance art. Ficino emphasized the immortality of the soul, which had been overlooked during the medieval period, and thus influenced the religious revival which took place during the next century. In 1512 immortality of the soul was added for the first time to the dogma of the Roman Catholic Church by proclamation of the Lateran Council. Ficino, Marsilio. Three Books on Life (De vita libri tres) (Vol. 11 of Renaissance Text Series). Translated by Carol V. Kaske and John R. Clarke. Tempe, AZ: The Renaissance Society of America, 2002. Ficino, Marsilio. Meditations on the Soul: Selected letters of Marsilio Ficino. Translated from the Latin by members of the Language Department of the School of Economic Studies, London. Rochester, VT: Inner Traditions International, 1996. Cassirrer, Ernst, Paul Oskar Kristeller, and John Herman Randall, Jr. The Renaissance Philosophy of Man. Chicago, IL: The University of Chicago Press, 1948. Marsilio Ficino, Five Questions Concerning the Mind, pp. 193-214. Kristeller, Paul Oskar. Eight Philosophers of the Italian Renaissance. Stanford, CA: Stanford University Press, 1964, chap. 3, "Ficino," pp. 37-53. Moore, Thomas. The Planets Within: The Astrological Psychology of Marsilio Ficino. Great Barrington, MA: Lindisfarne Books, Associated University Presses, 1982. This page was last modified on 23 August 2018, at 16:15.